This stucco is a bit tricky to get a good image of — you can’t get near it (for its own sake), and other parts of the structure it’s on block your view from ground level. So you need to work from a distance with a long lens. I used Topaz Adjust to bring out the colors and structure a bit in this shot. 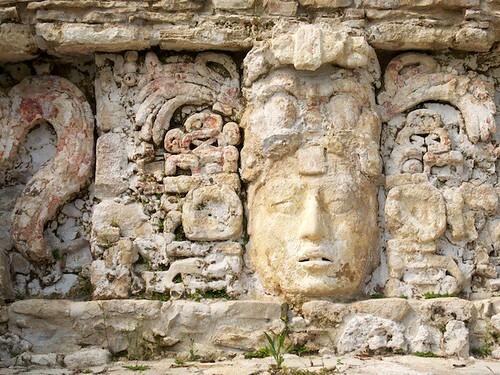 This entry was posted in Architecture, Ruins and tagged ancient, Architecture, art, Chiapas, Maya, Palenque, ruins, sculpture, stucco by Eric. Bookmark the permalink. Are the remnants of colour preserved from the original construction. I assume on the north side of the structure they would be protected from UV fading? Actually, this stucco is on the east face of the Palace (and it’s pretty well faded). When I get home tonight I’ll upload an “untweaked” version of the image so you can see how much I had to work on the image in order to make the colors visible. Thanks for posting the ‘untweaked’ image. I am amazed at how much colour is still in the original. I have yet to see any remains of paint in any of the belizean sites I have visited.